Iron is one of the most abundant elements in the Earth's crust and is widely used in almost every industrial sector, not least in water distribution. Its chemistry is dominated by oxidation-reduction reactions because it has three readily accessible oxidation states: 0, +1, and +2. Metallic iron ("zero-valent iron") is actually not stable in the presence of water at ordinary temperatures. It has a tendency to oxidize, that is to rust, if it gets wet, which means that cast iron water pipes have an inherent tendency to corrode. This tendency is exacerbated by the presence of disinfection chemicals, for example chlorine, which act by raising the oxidation state of the water to very high levels. 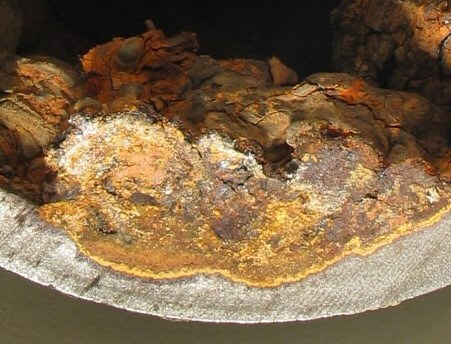 Thus corrosion of the iron components of disbribution systems can be intense and lead to significant pipe failures. Much, if not all, of the corrosion and scale deposition appears to be microbially-mediated. Heavily tuberculated cast iron pipe, Utility 2. Note about one-half the wall thickness has been consumed. Redox reactions are usually represented in Eh-pH diagrams, or more recently in pe-pH diagrams. For a detailed discussion of these diagrams and how to make them see the pdf Oxidation-Reduction. 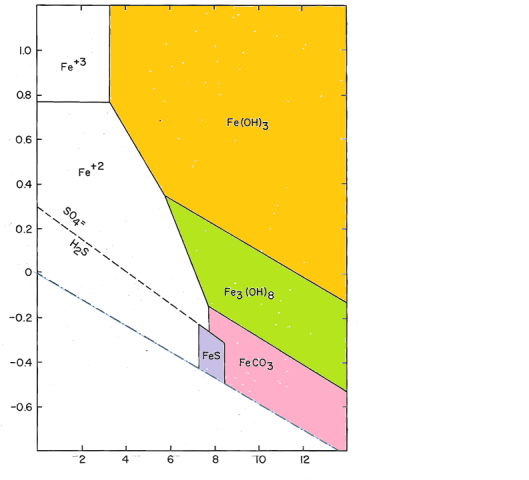 The iron diagram for the simplest case of iron + water is shown below. Here electrons are added, so this is a reduction. Metallic iron is stable only under conditions of Eh below the stability of water, so iron will react with water to release H2 gas. 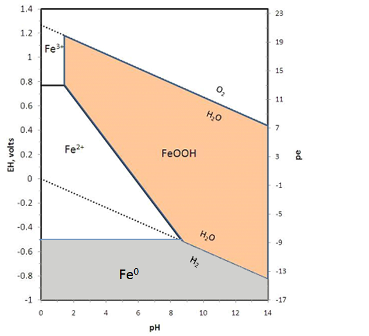 Within the stability field of water, iron is mostly insoluble as the oxide or hydroxide except under conditions of low pH and Eh where ferrous ions (Fe2+) dominate. Treated water will generally be strongly oxidizing (see Eh-pH diagrams for disinfectants) with pH above 7.5 so dissolved iron will be quite low. For the same reason, surface water sources tend to be very low in iron whereas groundwater sources commonly have some iron. To model actual distribution systems, we need to add additional components to this system. Both sulfur (as sulfide) and carbon (as carbonate) form stable compounds in corrosion scales. After adding carbon and sulfur, the size and shape of the field of soluble iron does not change much, but we see a larger number of possible iron-containing solids.The compounds shown are initial amorphous precipitates. Fe(OH)3 will convert to crystalline goethite, FeOOH; Fe3(OH)8 will become magnetite, Fe2O3; FeS will convert to pyrite, FeS2 by reaction with native sulfur. The carbonate, FeCO3, is the mineral siderite, which, like most carbonates, forms relatively rapidly and makes a crystalline precipitate. Corrosion scales in iron pipes are mostly made up of these four minerals, with goethite and magnetite greatly predominating (see Iron Mineralogy). Rather than a uniform coating on the inner surface of the pipe, iron scales deposit in rugged nodular features referred to as tubercles. The iron hydroxides and oxyhydroxides exhibit a strong tendency to adsorb heavy metal ions from solution (see adsorption by iron compounds). Both arsenic and lead have a strong affinity for iron compounds and are strongly concentrated in some iron scales down stream from sources of lead or in waters naturally high in arsenic. The physical release of lead-bearing iron particles has been shown to be a significant factor in lead exposure from drinking water, particularly from galvanized plumbing components.